Read This: Could Furious 7’s Luke Hobbs really break a cast by flexing his muscles? Furious 7 challenges the notion that cars can’t fly, letting cars drop from planes and soar between skyscrapers as if by magic. 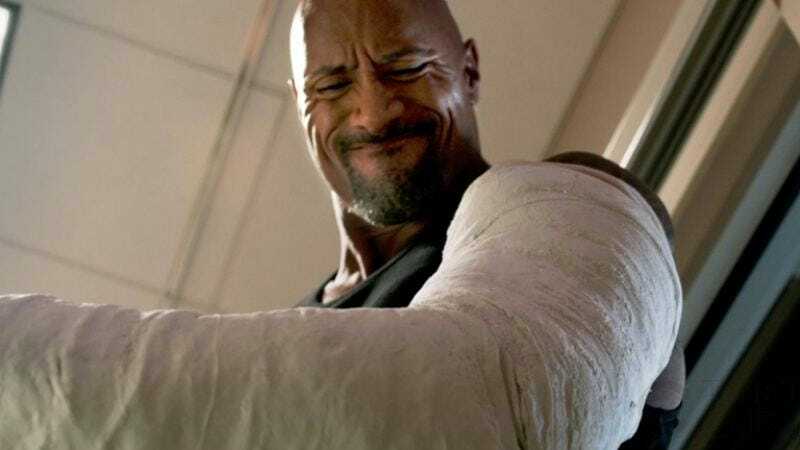 But when all is said and done, in the film’s final shootout, Dwayne Johnson’s Hobbs—sidelined for most of the movie by injuries after literally flying out of a building and landing on a car—decides to pull off yet another seemingly impossible feat. When he sees his friends are in danger, he turns to the camera and breaks out of his full-arm cast…by flexing his muscles. Now, the good people over at Vox are asking the tough questions, namely: Is this even possible? According to orthopedic surgeon Dr. Eric Novack, “it’s certainly not impossible.” Novack and fellow orthopedic surgeon Dr. James Rickert both tell Vox that breaking a cast with a broken arm would be incredibly painful—too painful for most patients to endure, especially if the break occurred recently. But this is no feeble human we’re talking about. This is The Rock, the closest thing we have to a real-life superhero. And his character, Hobbs, is certainly shown to be stronger—and more resilient—than the average street racer. Novack and Rickert ultimately conclude that the cast-breaker would have to be very strong, have a high threshold for pain, and the cast would have to be poorly constructed. While we can’t necessarily speak to the cast-making abilities of the fictional doctors in the Fast & Furious franchise, let’s assume they are below average to keep the magic of the moment alive.